The web of being is so intricate it is easy to feel lost sometimes, even if we aren’t actually lost at all. There is nothing wrong, really, with being lost from time to time. In fact, I think it is probably good for us for lots of reasons. Still, sometimes I need to orient myself to a pattern, a rhythm, or a story so I can make sense of where I am, who I am, and how to align myself with that knowing. Astrology is a map, a way to orient myself to what can often look like complete chaos (and sometimes is, and that is OK too). Astrology even makes room for chaos. After all this big cosmology dares to declare: “As above, so below. As within, so without.” That is a vast philosophy, isn’t it? It seems to hold everything. Back to the map. In my astrological practice, I pay attention to the cycle of a lunar month—the waxing and waning of this cycle gives insight about following intention and practicing mindfulness. I also pay attention to the wheel of the year—the Sun’s journey through the signs and seasons. This cycle tells us about a larger pattern of being alive on this earth within a community of other living beings. We’ve just experienced the Aries season of emergence. This season had some of us daring greatly; some of us individuating; and some of us developing a relationship to passion, anger, and will. These manifestations of Aries are all similar and yet different in the way each of us is expressing it. This week, the Moon wanes through the last few days of the Aries lunar cycle. We begin to surrender that experience. For some, this may be hard and for others, we are eager to leave it behind. Where are you? In the solar cycle, the Taurus season follows Aries. New lessons, urges, and responses to what has gone on before are called for by this next phase of the wheel of the year. Aries is Cardinal Fire and Taurus is Fixed Earth. From brash emergence in the Aries season, we are moved to form solid foundations in the season of Taurus. This transition teaches us that energy and passion alone are not enough. These get us started, but to maintain the momentum, we need to access our resources, create sustainability, and cultivate more patience and determination. Taurus’ secret power is knowing how to be led in this work by Beauty. The challenge thrown into Taurus’ lap is to embrace abundance, beauty and substance while cultivating the wisdom of knowing when enough is enough. The New Moon in Taurus on May 9 is an opportunity to acknowledge this stage of the journey with intention and mindfulness. 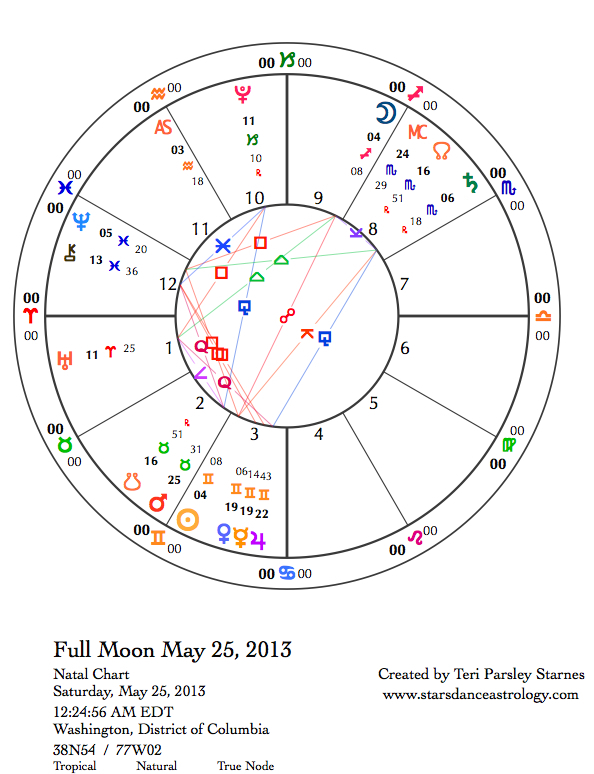 Forecast May 5, 2013 – May 11. May 5—Balsamic Moon: Surrendering. Are you aware of the times you stepped past your growing edge this lunar cycle? * Did you try anything new? Did it turn out the way you imagined? Or do you wish you could take back a rash action, a moment of anger, or a time when you played it safe and didn’t take the challenge given you? It is not possible to navigate the Aries season perfectly without mistakes. The Balsamic phase is a time to notice and let go of everything: failures and successes. At this stage, I now have a better understanding of the Antonio Machado poem about the golden bees making “white combs and sweet honey from my old failures.” There is an alchemy that happens when we surrender our imperfections. Can you find the sweet honey from this lunar cycle? The Moon returning to Aries reminds us of the intentions we set at the beginning. The trine between Mars and Pluto provides the earthy, powerful grounding that we need to trust the innate wisdom of nature’s cycles. We are where we need to be. The opposition between Mercury and Saturn colors this day with a desire to express ourselves clearly and meaningfully. Monday, May 6. Later this month, Uranus will exactly square Pluto for the third time since these planets of change began this transit in June 2012. (This is a long process of cultural and personal transformation. There are four more squares to come over the next two years.) The Moon nudges these giants today. Have you learned anything about acting impulsively this last month? Some passion is justified. You may get an opportunity to practice applying what you are learning about passion. Tuesday, May 7. Mercury in Taurus is asking us to be careful about our thoughts and words. We benefit from literal thinking by asking ourselves, it this expression useful? Is it true? Will it bring strength? Does it serve beauty? If we agree to discipline our thoughts today, we reap benefit. Cultivate steadiness. The body helps the mind to focus. A focused mind can bring healing to the body. Wednesday, May 8. The powerful New Moon tomorrow is already being felt. The Moon in Taurus opposes Saturn lending a tone of solemnity. Notice the fears around scarcity. These fears are teaching us about non-attachment. Beauty is still the secret power of this season. Dare to find beauty where you are. 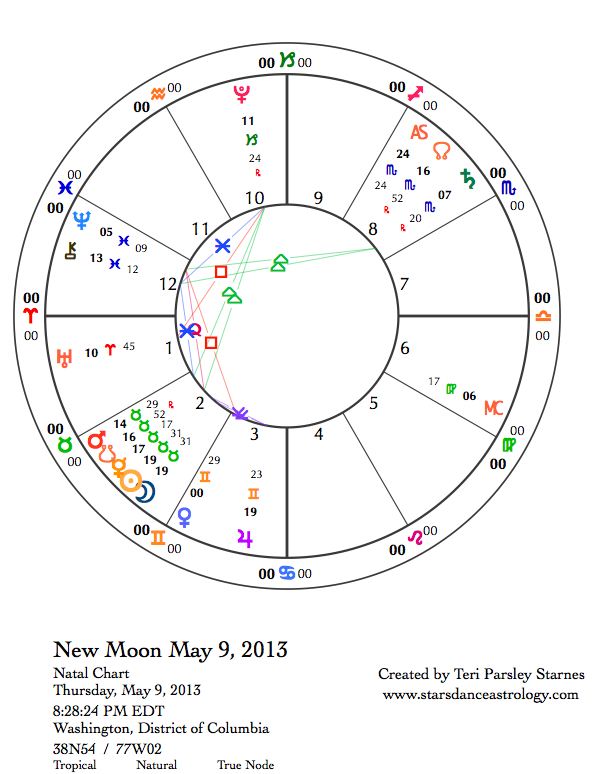 May 9—New Moon: Dreaming. Today’s New Moon in Taurus is also a Solar Eclipse, adding a sense of heightened intensity as well as unpredictability to the lunar cycle. That doesn’t mean we can’t set intention and practice mindfulness. In fact, it may be more necessary. As you dream about the potential of this Taurus season, what do you most long for? What tangible desire will you manifest? Saturn in Scorpio (the sign opposite Taurus) plays a big role this season. This planet of accountability insists we modify our relationship to money, possessions, and anything that we use as a crutch to stave off fears of scarcity. The potential of this lunar cycle is to tell a new story about sustainable relationship to the earth. Let’s learn the power of “Enough.” In the New Moon chart, Saturn is lending support for this type of transformation. There is a harmonious trine to Neptune from Saturn. We can be idealistic as long as we anchor it in realism. Mars, Mercury, and the Sun and Moon are near each other in Taurus. The closeness of Mars to the Sun means that mythically, the hero is still in the underworld communing with the light of purpose and devotion. Perhaps the quest is about the hero surrendering stubborn attachment so that new possibilities are reborn. We need the determination and strength of Mars in Taurus to help us navigate possible upheaval this month when Uranus will once again exactly square Pluto (May 20). Venus enters Gemini for just under a month. Venus as the ruler of Taurus is a guide to invoking beauty, charm, and pleasure. These qualities will appear most easily through social interactions and expanding mental horizons. 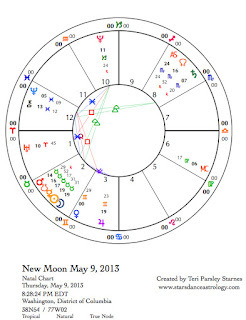 Venus squares Neptune in the New Moon chart. For the first part of this lunar cycle, we could notice a tendency to be duped by a person or situation that is too good to be true. However, we can find beauty in a fantasy. The effect this has on our hearts, making them more open and receptive, is a good thing. Friday, May 10. Delight in social contacts and mental activity is strong. The Moon contacts Venus. Where do you notice beauty today? Listen with open ears;ter the call comes on the wind and may be hard to pin down exactly, yet fills the air with a sweet scent of enticement. Saturday, May 11. Gemini shenanigans continue. Mercury, the ruler of Gemini, comes into its superior conjunction with the Sun. 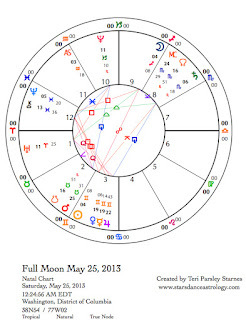 This is a pivotal moment in the Mercury/Sun synodic cycle. During its 88-day orbit of the Sun, Mercury spends some of its time as an Evening Star, some of its time as a Morning Star, some times too near the Sun to be seen and some of the time moving backwards in relation to the stars behind it. This busy planet is a good symbol for our busy minds. Midway between its shift from the morning sky to the evening sky, Mercury visits the Sun for a conference about Taurus. Quick-witted Mercury doesn’t always feel comfortable under the sway of this Fixed Earth sign. Do your thoughts feel sluggish? Or are you feeling particularly stubborn about your own point of view? Let the Sun burn away mental resistance. The gift can be a calmer, more focused mind.